K-PAC’s KP2sH Stationary Compactor is an affordably priced 6″ diameter single cylinder stationary compactor that delivers all the quality you have learned to appreciate from “THE TREND SETTERS”. 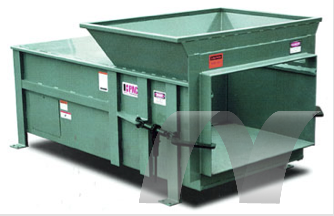 This stationary compactor has a large clear top opening 45″ by 58″, WASTEC rated 1.72 Cubic Yards. This unit is suitable for those small industrial applications, hospitals, retail and food stores. 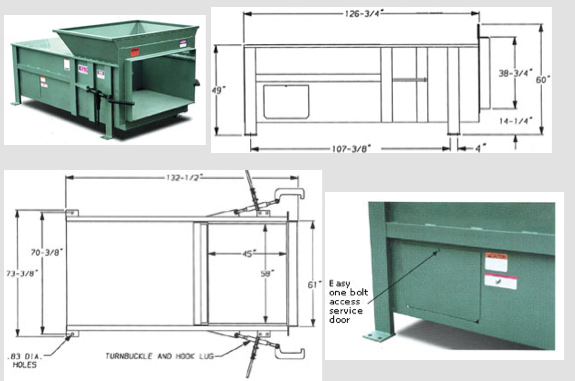 Ideal for the solid waste stream or recycables, this unit cycles at 62 seconds and develops 66,450 lb. maximum packing force. With the KP Series of Compactors you can expect a clean, fast and trouble free operation of your Recycling and Waste removal efforts, from K-PAC Equipment, “THE TREND SETTERS”.